Shimano spinning reels are awesome, I’m sure most of you anglers will agree! But there are just so many reels to choose from, so where on earth do you even start? I decided to use my knowledge, experience and the extensive research I have done myself to put together this comprehensive guide, the best Shimano spinning reels 2019. This selection of reels will cover a wide range of specifications, prices and functionality, so there should be something here for everyone. The following reels have been chosen for their overall quality and design features. The price range will vary significantly, so there will be something available for all budgets. Now I will go into more detail about each of the above mentioned Shimano spinning reels, so you can make a more informed decision on which one is right for your needs. I love this reel! I personally have the Ci4+ FBHG 2500 model, and it immediately became my number 1 choice for soft plastics and light lure fishing. I usually pair it up with a light 6’ 2-4kg spin rod, and I can flick away all day with no fatigue as the rod-reel combination is so light and easy to use. The latest overhaul of the Shimano Stradic Ci4+ FB has resulted in a stronger design and less weight than previous models. It also feels incredibly smooth to use, this largely due to the new Magnumlite (MGL) rotor, which is 22% lighter than the previous model, and also produces 22% less inertia. The retrieve on the Stradic Ci4+ FB is seriously responsive, with a solid gear ratio that you’ll find will make things very efficient. The Coreprotect design that Shimano has integrated in this reel ensures that the internal elements of the reel are protected from dust, sand and water, so you can expect the reel to last longer and perform to its maximum potential for a long time. It also uses Shimano’s Xship technology, which produces improved gear efficiency through a double bearing supported pinion gear system. This in turn will add more cranking power and torque to your retrieve, and is another element of the smooth experience this reel provides. One thing that should be mentioned about this reel is the fact that it does not have an anti-reverse lever. I was not actually aware of this when I purchased my Ci4+, but I soon got used to it and now I don’t miss it at all. But for some anglers this could be an important factor, so definitely worth mentioning. Shimano has removed the anti-reverse lever from a lot of their spinning reels to make them more water tight. Although the removal of this lever may be a miss for some, it will provide more longevity and durability to the reel. This reel is not going to be for everyone that is looking for a Shimano spinning reel, for one main reason: the price! But for those that want the best, and do not bulk at having to pay the hefty price tag attached to the Shimano Stella FI reels, then you can be assured you are getting a spinning reel of the very highest quality. Before we get into the technical aspects of the Stella FI reel, I just want to talk about the stylish looks it has, as this is the first thing you will notice before you even start to use it. If this reel was a human, it would be a super model, strutting confidently down the catwalk. If it were a car, it would be Lamborghini roaring its meaty engine while waiting at the traffic lights. Ok…enough of the corny analogies, but it’s easy to get carried away with just how good the Shimano Stella FI reel looks! There is a reason why the Stella FI reels are expensive, and that’s because every top-end component Shimano makes for their spinning reels has been included in the FI range. You get the perfect balance of finesse and brute force, which make it suitable for all kinds of light-line fishing, from freshwater lakes to salt water locations. Most Shimano spinning reels are built with solid components and have features that will enhance your fishing experience. But as mentioned, the Stella FI range contains the best of the best, and some of the features these reels provide will just make your fishing that much easier. The Micromodule Gear Technology will ensure any vibration is pretty much eliminated, so you will find winding extremely smooth. It also means improved feel with the lure, so any knocks can instantly be acted on. The S-Direct gear system on the Stella FI is designed to eliminate any unwanted movement of core elements within the reel. It does this by providing precision alignment with the gear components. The G Free Body design has shifted the center of gravity of the reel closer to the rod. The worm shaft oscillation mechanism is now situated at the top of the body of the reel, which makes for more efficient winding and less fatigue when fishing for long hours. Shimano has now added their Hagane design concept to their Stradic FK range, giving the reel the added durability and toughness while improving the smoothness and precision of the retrieve, this giving the serious angler the added performance they demand from their reel. As soon as you start using the Stradic FK reel, you immediately get that feel of strength and power. This is great for the confidence when you smack into a big hard fighting fish, and you can focus purely on what you need to do rather than having to worry about whether your reel can stand the abuse. The Stradic FK can stand a lot of abuse! You will find some of the latest Shimano technology in the Stradic FK reels, and this is clearly evident as soon as you start using them. As already mentioned, the new FK HG reels are built using the Hagane gear and body design concepts. This makes this reel feel strong and responsive, plus you get the added durability that Hagane provides; you can can expect your Stradic FK to last a long time, eve with heavy and frequent usage. The Stradic FK also uses Shimano’s X-ship technology, which helps to provide the incredible smoothness you find in this reel. What are the main differences from the Shimano Stradic FK and the Stradic Ci4+ reels? The Shimano Stradic FK reel is around $45-$55 cheaper than the Stradic Ci4+ reel, depending on what size you get. So what are the main differences between the two, and is it worth saving the approximate $50 difference and getting the Stradic FK? One of the biggest differences in these two reels is the weight. The Ci4+ has some different design elements the have reduced the weight, while still maintaining the power and strength of the reel. To give you an example of the weight difference, the Stradic 2500FK weighs 235 grams, while the Stradic 2500CI4+HGFB weighs just 190 grams. But this weight difference is far from extreme, and the Stradic FK is still a very light reel to use. Another feature that the Ci4+ has that the FK doesn’t is the Magnumlite Rotor, which provides minimal inertia when getting the reel started. Bottom line – so the Stradic FK does lack some of the advanced technology and design concepts that the Ci4+ model carries. But the reel still performs extremely well, and certainly feels a significant step up from the reels in the $100 price range. If you are very serious about your fishing, and you intend to put in the long hours and want every advantage you can get, then the Ci4+ will probably be the best choice for you. But if you just want an upgrade from your $100 reel, with some cool features and solid design, then the Stradic FK is an excellent option. At last! 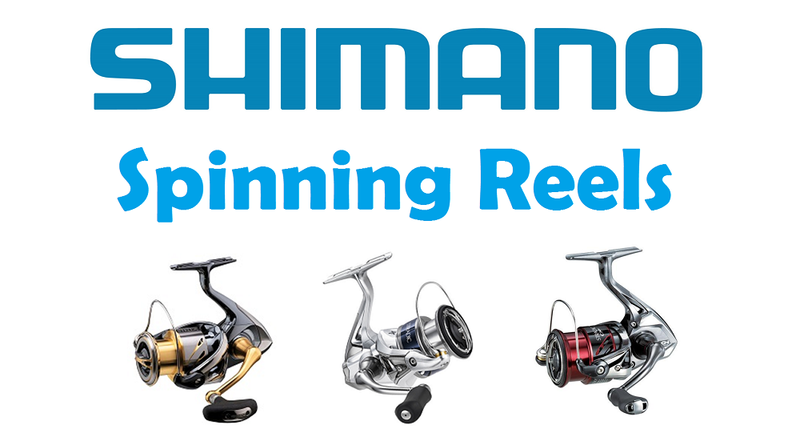 Shimano has launched a spinning reel with high-end features for around $100! If you are looking for a quality Shimano spinning reel with high-end design features, without having to fork out the big bucks for it, then the Nasci FB could be the ideal option for you. Launched in 2016, the Nasci FB has quickly found its place in amongst the quality ranges of Shimano spinning reels. You will find a lot of the technologies used in the Nasci FB reels are the same as in more expensive Shimano spinning reels, such as the Stradic and Technium ranges. There is a consistency among all of the top range spinning reels from Shimano, and that is their smooth drag action and efficient retrievals, coupled with their power and precision. You will find a lot of this in the Nasci FB range too. Considering this reel costs around the $100 mark, you are getting a very good reel for the money here. You have plenty of drag to work with on this reel (up to 11kg depending on which model you have). The range of sizes available in the Nasci FB range will ensure that there is the ideal size here for anyone looking for a light spinning reel. Although the Nasci FB reels are not as light as the Stradic Ci4+ reels, they are still pretty light and easy to use. You will be able to use these for long periods of spin fishing if you pair the Nasci with a light rod. *Note - As with the Stradic Ci4+ FB reels, the anti-reverse lever is also missing from the Nasci FB range. *Note – the 2500 and 3000HG models are actually the same size, the only difference being the lower gear ratio on the 2500 model, and the extra line capacity available on the 3000HG due to the deeper spool. If you are on a budget and want to take advantage of Shimano quality in a low-cost reel, then the Sedona range is an excellent option. Great for those just starting out, or for anyone that just doesn’t feel comfortable spending over 3 figures on a reel. Obviously you will not be getting the high-end specs that you will find on some of the more expensive ranges of Shimano spinning reels, but the Sedona range is not just a reel that offers nothing other than a cheap price, it does have some very good features built into it. With the Sedona spinning reel being available from 1000 up to 4000, there is a lot of room for all kinds of fishing here. Freshwater or saltwater fishing, boat or shore fishing are all possible with the models that Shimano offers in their Sedona range. The Sedona uses Shimano’s AR-C spool design, which has been designed to improve casting distance. The top lip of the spool allows the line to come off more easily, reducing resistance and thus allowing it further distance on the cast. Now, I have no comparative data to say if the AR-C design does indeed provide extra casting distance against a reel that does not use AR-C. But I can say that it does cast good distances without any excessive effort. The compact body design of the Sedona makes it easier to use than larger more bulky reels. It is also designed to reduce weight as well, and for a reel in this price range it certainly does not feel as heavy as a lot of other reels around the same price point. To make the Sedona reel as light as possible, Shimano has used some plastic components such as the drag knob and the T-knob at the end of the handle. But it is also made with Shimano’s composite HGT 7 M-compact body, which main purpose is to provide strength in a lightweight design. The combination of the Power Roller II and Propulsion line management systems ensure that line comes on and off the spool with extreme precision. The Power Roller II feature also helps to reduce any twisting in the line. If you are just starting out, and you don’t want to spend a lot of money on your first fishing reel, but you still want one that will last, the Shimano Sienna FD spinning reel is a great choice. Obviously you are not going to get all of the bells and whistles that Shimano have on their more pricier reels, but the Sienna FD offers a robust design that does its job well, and is built to last. The “FD” stands for “Front Drag”, which as it sounds, means the drag knob is at the front of the reel on the top of the spool. Previous models of the Shimano Sienna had a rear drag system, but I have always preferred front drag reels as the drag is easier to adjust when you’re fighting a fish. All of the above mentioned features ensure that the Shimano Sienna FD reel runs very smoothly, and will give any beginner angler more than enough to catch a variety of fish and learn how to use a drag system. It is a very easy reel to use, so if you just want to focus on your fishing, you won’t be side-tracked by any additional features that can add more confusion than help to the beginner angler. The range of sizes will ensure the reel can be used for freshwater, lake, estuary or salt water fishing. I have nothing really bad to say about the Shimano Sienna FD spinning reel. Obviously you are not going to get high-end components on this reel, but that is not what it is. Great reviews mate, I’ve been using a Sienna for a couple of years now, caught some big fish with it coupled with 20 pound fireline braid. The drag works very well under preasure including big runs from Spaniards and levering bottom hugging snapper to the boat. I’m definitely going to buy another Sienna soon. I just received a Shimano Sedona 4000GX, and although its owner’s manual shows an antireverse lever, mine does not have one. I have lots of other reels, and they all have tha antireverse lever, but I never use that feature, as allowing the reel to spin backwards almost always causes birds’ nests. So I am not complaining–just wondering about the owner’s manual. I can only assume that the manual you got with the Sedona is for an older model. The latest model does not have the anti-reverse lever, so I can’t see any other reason why they would show it in the manual, unless it was for an older model. The reason some reels has no anti reverse is simply to make it more waterproof. You may have noticed the screw-in handle as well instead of one with a rod that goes through the opposite side with a screw knob. These adds in to the reel being water resistant. Thank you for your review and guide… this help me a lot….